This year, the Mariner Class Association will be celebrating the 50th anniversary of the birth of the O’Day Mariner. Mariners are found just about everywhere, especially in the Northeast where they were built. It’s surprising how often I’ll see a Mariner sitting in someone’s backyard on a trailer while driving along the coast. More than 4,000 hulls later, the Mariner is still in production and has a very rich history. The O’Day Mariner has an older sister: the Rhodes 19, a popular racer with fleets all over the country whose own lineage can be traced back to the Philip Rhodes-designed Hurricane from the 1940s. When George O’Day – an Olympic gold medalist and designer of the well-known 17-foot Daysailer – came on the scene and started producing the Rhodes 19 in fiberglass, he recognized the growing popularity of sailing as a family sport. Using the Rhodes 19 hull, he modified the cockpit, added a good-sized cuddy cabin with a V-berth, redesigned the deck, simplified the standing rigging and named it the “O’Day Mariner.” Hull number one rolled out of the Fall River, MA factory in 1963 and was O’Day’s first venture into the cruising market. 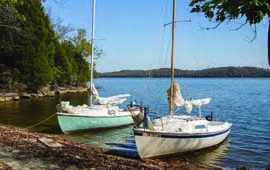 For easy trailering and sailing in shallow waters, a cast iron centerboard was made an option, and over the years the centerboard model became the more popular design. In 1966, the Mariner Class Association was formed to promote the O’Day Mariner, and the Association kept in close contact with the O’Day company, which was very supportive in getting the Association up and running. Even Philip Rhodes himself was pleased to hear of the Association’s formation and offered his and his staff’s assistance should something be needed. In late 1968, O’Day introduced the Mariner “2+2” model, eliminating the small rear deck and extending the already large cockpit to the transom, enclosing the previously open cabin, raising the cockpit sole, making the cockpit self-bailing, and adding quarterberths. (The addition of quarterberths added sleeping accommodations for two to the previous capacity for two on the V-berth; hence the “2+2” name.) The deck design was further streamlined in 1972, and Mariners were produced in this configuration by the O’Day company until 1979 when it decided to drop the Mariner and focus more on big boat production. In 16 years, O’Day had produced an amazing 3,771 Mariners. 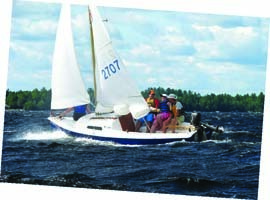 With the Mariner molds up for grabs, Rebel Industries’ Spindrift One-Designs bought them and began producing the boat in 1980 under the name “Spindrift Mariner.” They sent a letter to the Association announcing how excited they were to continue producing the Mariner and how they hoped a mutual relationship would be started and last for many years to come. The following year, the president of Spindrift brought a new factory-built boat to race in the 1981 Mariner Nationals. He won handily, but the boat was later found be about 40% lighter than boats built by O’Day. After much soul searching, the Mariner Class Association officers retroactively revoked the measurement certificate and re-scored the Nationals results. Interestingly enough, only two years later, Spindrift sent the Association the equivalent of a “Dear John” letter, informing the Association that they had become interested in another 22-foot sailboat and were dropping the Mariner. Furthermore, they wanted the Association’s help finding a new buyer…so much for their excitement about the boat. The author (at the helm) and his father at the 2011 Nationals. © Steve Hock. Along came Stuart Marine, a new company based in Rockland, ME, who bought the molds and started producing the Mariner and the Rhodes 19 in 1984. They have been in production ever since, a rarity compared to so many other boats designed during the “classic plastic” era whose productions have ceased. Production of new “Stuart Mariners” at Stuart Marine certainly isn’t at the rate it once was in the 1960s and ‘70s, but Dave Whittier, the company’s owner, keeps his business afloat by also selling a couple other boat models under the Stuart name, reconditioning old O’Day Mariners and Rhodes 19s, and maintaining a brokerage of boats for sale. For owners of old Mariners to be able to buy any kind of replacement part from Dave is a huge advantage. It should also be mentioned that Rudy Nickerson, owner of D&R Marine in Assonet, MA, used to be the stock room supervisor at the O’Day factory in Fall River, MA during the mid-1970s. When O’Day went bankrupt, he bought many original O’Day parts – including parts for the Mariner – and now offers them, as well as new parts, for sale at his store, which is not far from the old O’Day plant. He is also a great resource for Mariner owners. 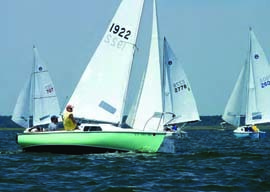 Since its inception, the Mariner Class Association has had a pretty large emphasis on racing, and to that extent, there are four large racing fleets: Brant Beach Yacht Club (NJ), Surf City Yacht Club (NJ), Riverton Yacht Club (NJ), and Narrasketuck Yacht Club (Amityville, NY). In recent years, however, the group has made a conscious shift to equally support daysailing and cruising. Several new “fun” fleets have popped up whose members aren’t necessarily members of yacht clubs; they simply get together as a group and sail for an overnight trip or two during the summer. 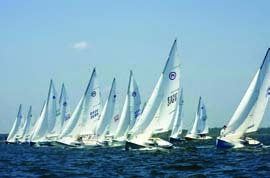 These fleets are organized at the Great Lakes, Lake Nockamixon (PA), and on the Niantic River in southeast Connecticut. There is even a community sailing center in Key West, FL that uses Mariners as training boats. To help celebrate the 50th anniversary of the birth of the O’Day Mariner, the Class Association is organizing a big “Rendezvous” to take place at Mystic Seaport in Mystic, CT from August 9-11. Those able to bring their Mariners will be launching at the Niantic River on Friday, August 9 and sailing to the Seaport, staying overnight both Friday and Saturday nights before sailing home on Sunday. On Saturday, there will be many activities for all Association members, culminating in a buffet dinner at the Seaport with guest speakers including Dave Whittier from Stuart Marine. The hope is to have 100 members and at least 20 boats in attendance. This will be an exciting year for the Mariner Class Association! Visit usmariner.org to check out the Association – members have access to a tremendous amount of information, including manuals, forums, galleries, an extensive “FAQ” section, all 47 years of newsletters, and much more. We have about 400 members across the country and beyond, and you’re welcome to “join the party” even if you just have an interest in the Mariner. And, if you’d like to own one, I bet our members would be able to help you find one, too. Nathan Bayreuther, the owner of Mariner #1922 Orion and President of the Mariner Class Association, grew up in Niantic, CT next door to his family’s boatyard. Currently living in Wallingford, he is a professional organist and can frequently be found sailing the waters of Long Island Sound in his spare time. He can be reached atbayreuther@sbcglobal.net. For more information, visit nathanbayreuther.com/mariner and usmariner.com.